HafeziCapital understands that every corporation has a different level of tolerance, and thus the risk mitigation and management of each corporation’s decision-making process is based on Return on Investment (ROI), and the tolerance of senior managers. No two organizations are the same and each requires a different approach. Organizations many times fail to understand the full spectrum of the risk premium associated with their decision-making process, because they may have limited factual data from which to develop their perspective model. HafeziCapital can help organizations understand the full spectrum associated with their decision-making process and helps organizations develop their own metrics to assess future challenges and its decision-making process. Strategic and Enterprise Risk Management encompasses the methods and processes used by organizations to manage risks and seize opportunities related to the achievement of their objectives. This provides a framework for risk management, which typically involves identifying particular events or circumstances relevant to the organization’s objectives, assessing them in terms of likelihood and magnitude of impact, determining a response strategy, and monitoring progress. By identifying and proactively addressing risks and opportunities, enterprises protect and create value for their stakeholders, including owners, employees, customers, regulators, and society overall. HafeziCapital helps clients set corporate governance standards in accordance with regional or global standards. By creating a cohesive and transparent corporate board structure, organizations ensure minimal active investor challenges and limit possible law suits by regulatory agencies. Furthermore, HafeziCapital assists clients in developing adequate compensation packages, separation, and definition of upper management roles and a transparent relationship with shareholders. HafeziCapital partners with management, board members, and outside counsel to assist organizations to comply with regulatory requirements, respond to situations of noncompliance, and improve the processes around information systems supporting GRC. HafeziCapital helps clients take a disciplined approach to managing credit, market and operational risks through a combination of assessments, process improvement, and model review and validation. HafeziCapital helps organizations to move the entire system across the organization to ensure full organizational compliance. HafeziCapital understands that one of the most important assets that organizations develop is their reputation within the business community. Failing to properly assess, plan and prevent these risks can become an issue of survivability for many firms. 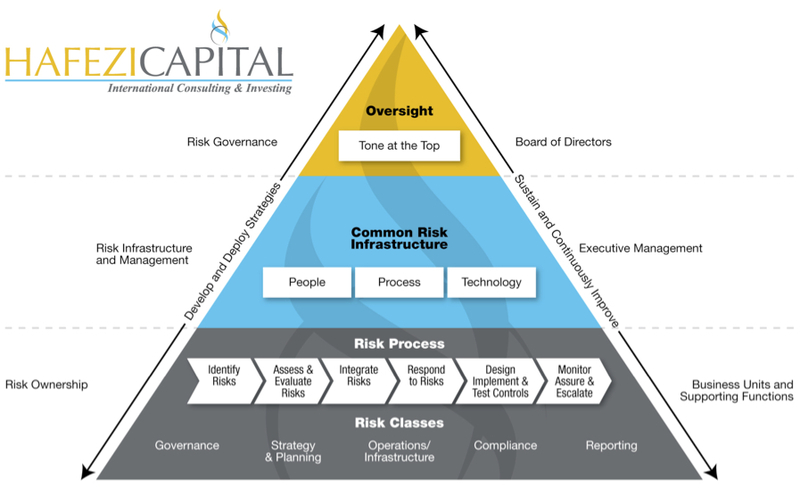 HafeziCapital can help your organization identify the develop contingencies, develop risk mitigation and prevention techniques. The first steps always start with recognition it, both from a cost and an organizational perspective. The latter steps involve risk mitigation, systems development, executive, and line-manager training in risk analysis, risk metric development and proper implementation of the risk system.